The Shaw hand-held diamond core drill has been used for a wide variety of purposes. Doubtless this equipment applications range will increase with user experimentation and tool improvements. The purpose of this section of our website is to list these applications, illustrate them by presenting Shaw equipment user comments, some of which will be our own, and to present a blog forum for technical discussions. 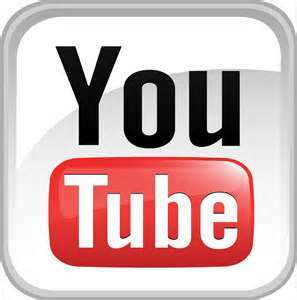 Several years ago Ralph Lewis of southern California was kind enough to make a video about his use of our drill. Ralph went on to describe our second generation drill in a second video. 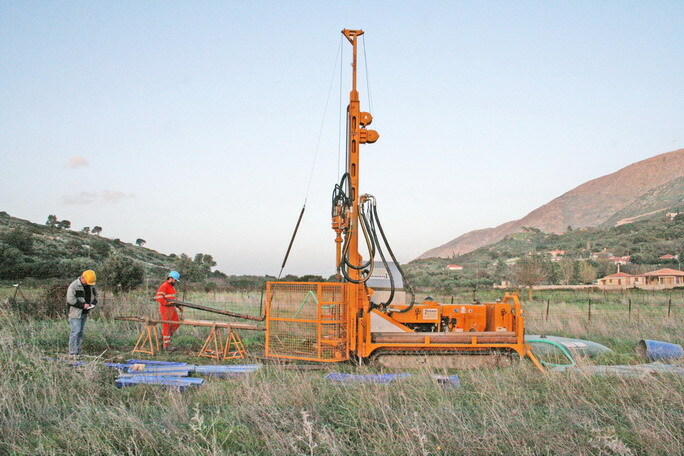 In 2009 I flew with a kit of my first generation drilling equipment to Kefalonia Island (west coast of Greece) to advance a series of borings for the "Odysseus Unbound" investigation led by Robert Bittlestone. 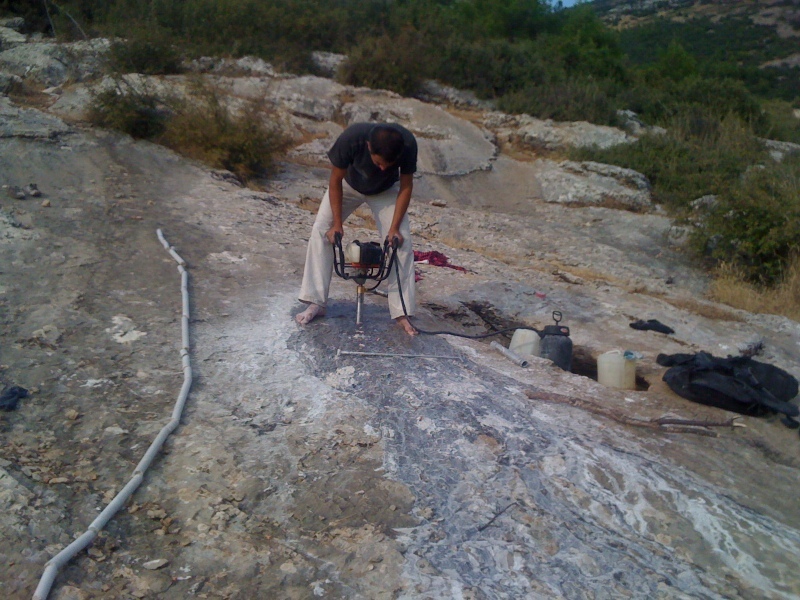 Although the borings which we made in very fractured and void-filled rock (rotten limestone) more than fulfilled Bittlestone's original requirements, distortion of drill string couplings and unnerving near losses of drill string down-hole demonstrated the performance limits of my original gear when used at depth in fractured rock. When I returned from Greece I immediately made new drawings of more robust male and female coupling components which would be twice the thickness of the originals and also called for heat treatment to make them much harder. Also, I designed and had made a new tool, the loose materials bit (LMB), a water injected, carbide tipped bit, later found to be largely immune to jamming in unstable, soft materials. Bittlestone later used the improved drill string and the new LMB to establish a Shaw drill depth record of 23 meters. 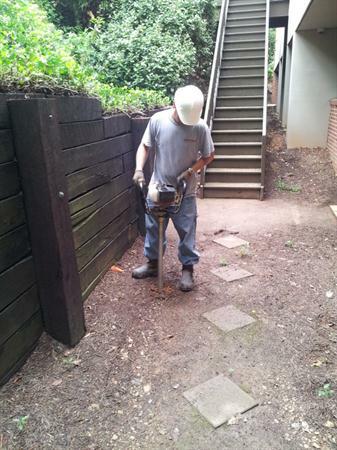 Based on the findings of our small drill work a bigger drill (below) was then used for deeper vertical definition. 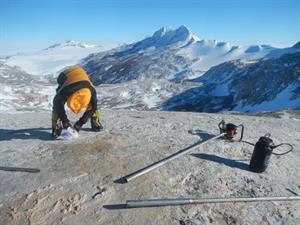 For this research project I hoped to be able to take a rock core from an ice-moulded mountain top in Antarctica to work out the last time the mountain summits had been covered by ice. I can do this by measuring the build-up of rare cosmogenic nuclides that form at a known rate in rock minerals at particular depths in the core. The difficulty was finding a drilling system that I could physically manage to carry up a remote mountain in a rather cold environment. This is when I discovered the Shaw portable backpack drill. With great help and advice from Neil and Kenna at Shaw, I ordered a system to recover a 5cm-diameter core. Once in the field, we waited for a warm (ish) day to carry out the drilling. 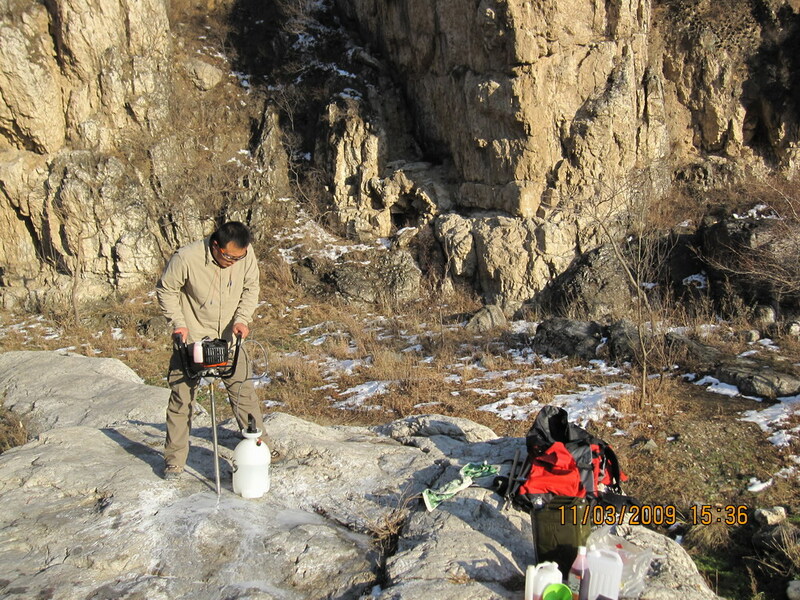 The temperature was warm enough at the base of the mountain that we could access melt water to use as drilling fluid, thereby avoiding the need to melt masses of snow/ice. 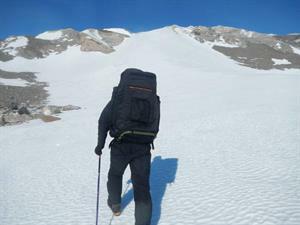 Six of us carried the drill and water to the mountain top 2,000 feet above the glacier. The site was incredibly exposed to the wind and the temperature was about -18º C at the summit not considering wind chill. 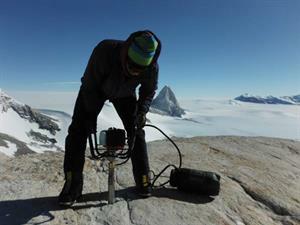 The drilling was made challenging by the low temperature, high winds and a few key mistakes. Mistake number one was using a new drill bit that I had not primed properly beforehand. I had swapped out the bit I used in the UK when I tested the drill for a new bit which I could only prime on a bit of gravel at the base of the mountain. This lack of good priming meant I struggled to get the bit to bite the rock and for a while I just created mud rather than a core. The second key mistake was not adding enough antifreeze to the fluid. We struggled with frozen tubes and valves all day, using our only drinking water (in a thermos) to thaw the tubes. However, despite our mistakes and the challenging conditions we faced, we did ultimately succeed in retrieving a 1.6 meter long core! This will be incredibly useful for our research on the ice sheet’s history. I can say that the drill itself worked beautifully and was very economical on fuel. The component parts are of very high quality and worked flawlessly and were easy to manage despite frozen, wet hands. I cannot recommend this product enough! 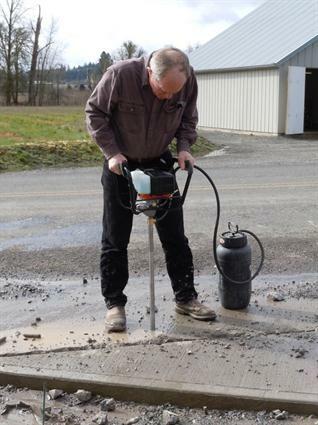 The Shaw drill has been used in the western U.S. for soil investigations and monitoring well and in-situ bioremediation systems installations at gasoline and chlorinated solvents release sites. No other drill which I’m aware of allows a field worker to so inexpensively, quickly and conveniently place very numerous soil borings in nearly all kinds of materials. Findings from five or seven conventional hollow stem auger or geoprobe borings placed in a release site hardly constitute an adequate gasoline or solvent release map because nearly all such sites are hydrogeologically complicated by buried utility trenches, building excavations, deeply buried foundations, and unknown earlier generation storage tanks. 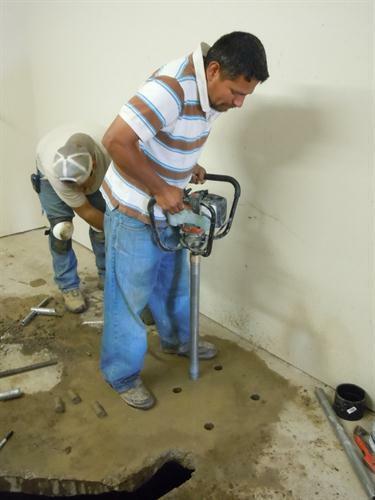 The Shaw drill allows a field worker to advance dozens of small borings quickly and easily wherever needed, almost regardless of the material or location involved. 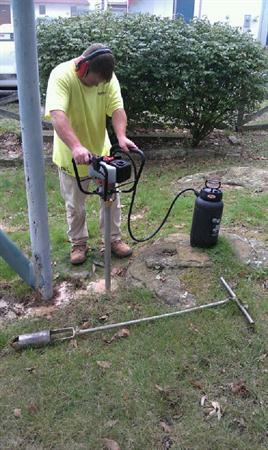 The Shaw drill can be used inside, behind and sometimes even under some buildings, in steel reinforced concrete, unconsolidated fill materials (with bentonite paste), under trees and overhead lines, and near storage tanks and other sensitive buried objects. I’ve also found that my drill can be used for sediment sampling and well installations from a small boat (in calm water). “Bhate Engineering Corporation is a geotechnical consulting firm headquartered in Birmingham, Al. which is located at the southern terminus of the Appalachian Mountains. In our home county we have outcroppings of three Geologic Provinces. Two of these are in competent sedimentary formations of , the Cambrian thru Silurian, deformed, folded and thrust faulted, Valley and Ridge and to the north and west, the flat lying over consolidated Pennsylvanian thru Mississippian, Warrior Basin. To the south and west, are the loosely consolidated Cretaceous sands clays and marls of the Gulf Coastal Plain which abuts both. We have used the Shaw tools in all of them. 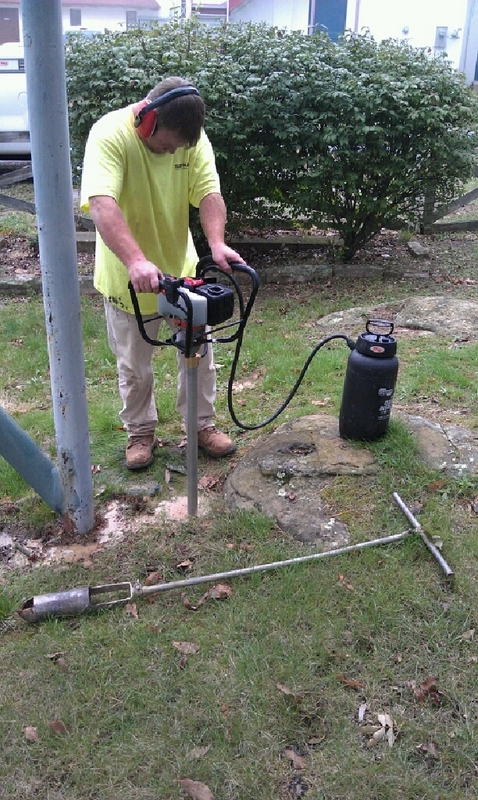 We purchased the 41 mm Shaw sampling equipment and have used it for over a year. It has gotten us on jobs which were not accessible to our ATVs and truck mounted drill rigs. 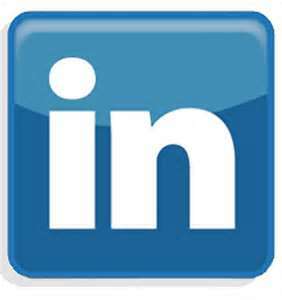 We have found Shaw’s tools to be reliable and valuable for our work. We have only had to replace one diamond bit and that was during our learning time. Core recoveries have been consistently good in competent, fractured, and weathered rocks. A representative description of the type materials in which we have drilled and sampled with the Shaw system follows. 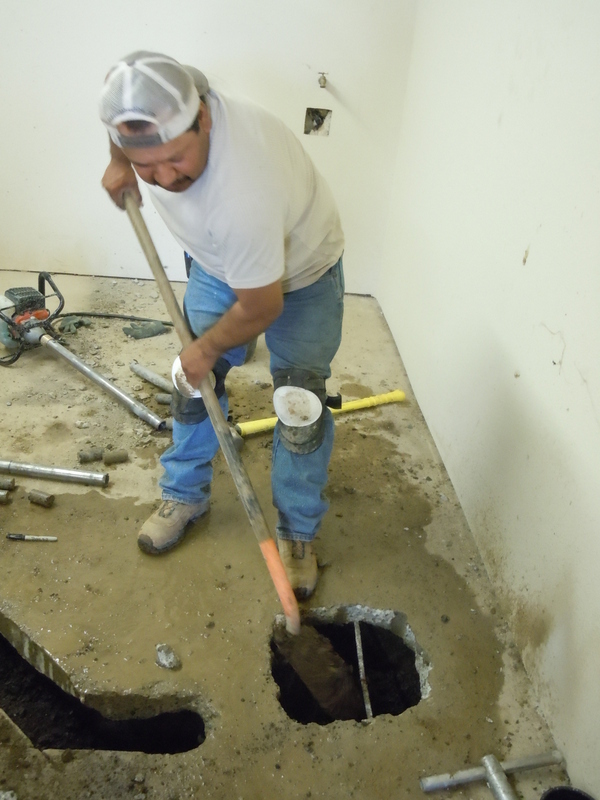 We have also used for probe holes within an operating manufacturing facility, specifically, thru and under a concrete floor slab underlain by 5-7feet and stone base fill and plastic residual soils. 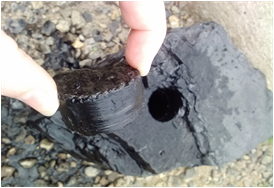 President, South Bay Exploration, Ltd.
“We have used the Shaw Core Drill extensively since we purchased it and have found it to be an extremely useful tool for sampling sulphide bodies and outcrop on our properties. 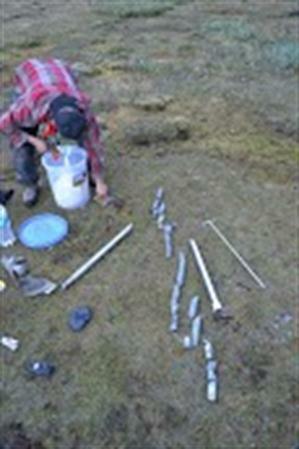 We have drilled and sampled to a depth of 10 feet - well below the depth that a hammer can attain. 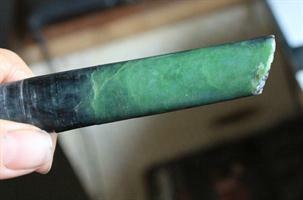 In the initial test of our Shaw Core Drill I cut several cores in jade. This material was fractured but I found that I could retrieve core fragments as intact cores with the Shaw core catcher. I was able to cut cores of sixteen to twenty inches in length before retrieval was necessary. I began by using a lot of water but soon found that very little was actually needed. I found also that the 26 cc Tanaka engine of the kit uses very little fuel even at maximum power output. Our exploration horizon has definitely expanded beyond placer with the introduction of this hard rock exploration tool. 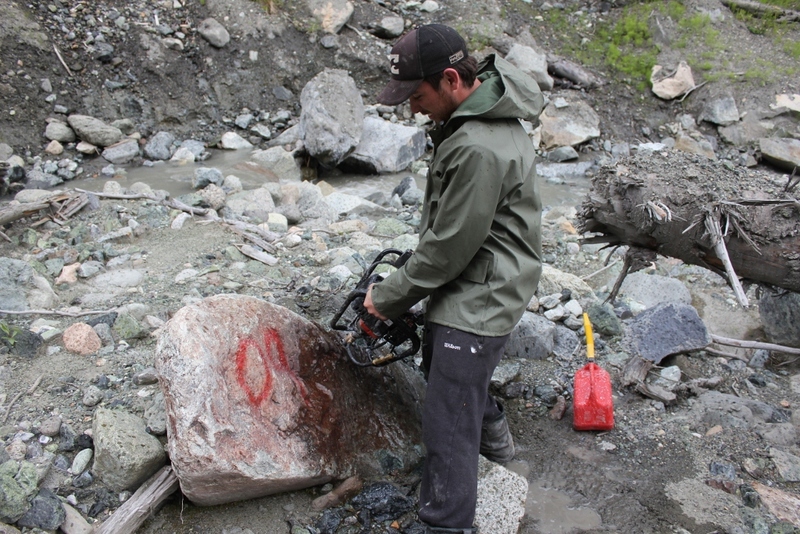 Jade boulders are some of the toughest stones to drill, and since we switched to Shaw Pack Sack drills, our exploration program has improved significantly. 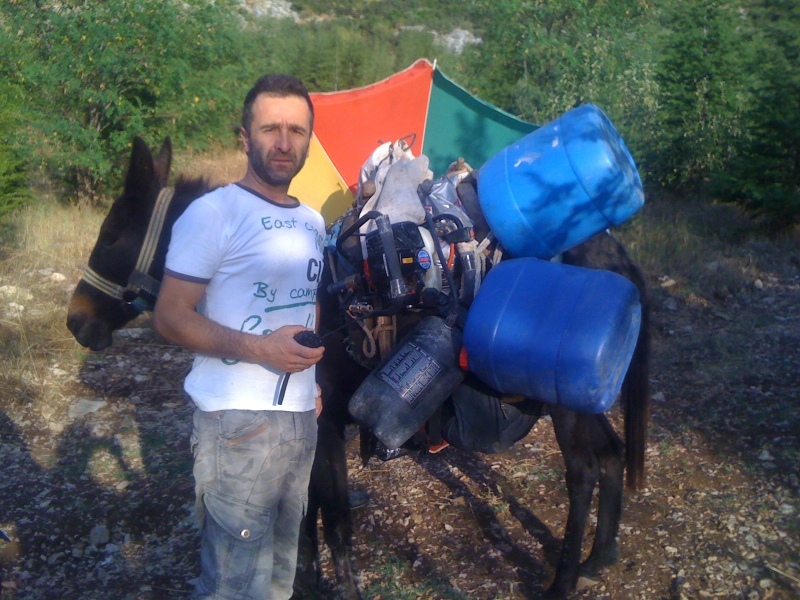 Lightweight for packing, extremely well built and designed, easy to operate, and hundreds of hours without any repairs. Diamond bits are excellent and long lasting. Congratulations to Shaw, one great drill. 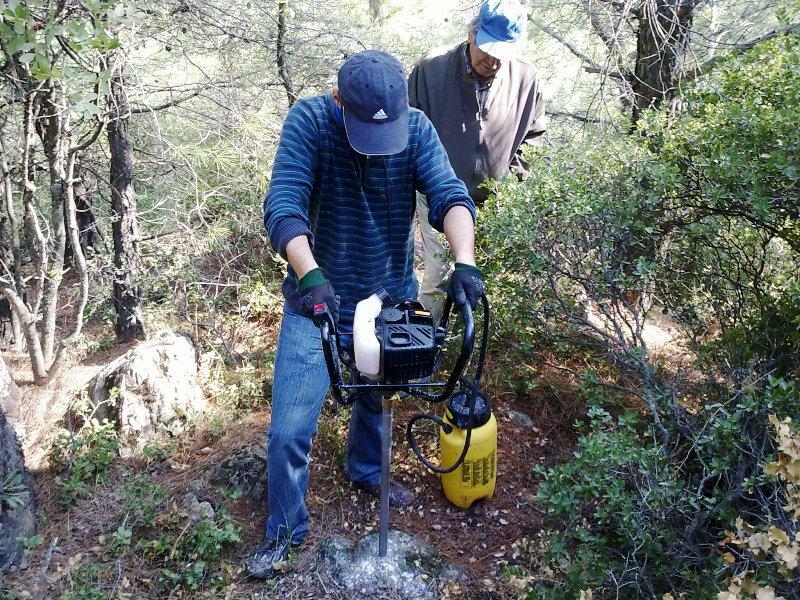 We used the Shaw Backpack Drill to core sample a prospective mineral deposit in the wilds of Northern California. The uphill trek was no problem carrying the unit. The instructions were excellent and the setup took very little time. The back pack drill performed exceptionally well. It uses a small amount of water and on our first attempt we were able to drill about a foot an hour into a rock with Mohs hardness of 6.5. For a total of 5 foot of core sample in 4 hours 20 minutes. We broke the cores off about every foot or less with the core breaker and easily removed them with the core catcher. 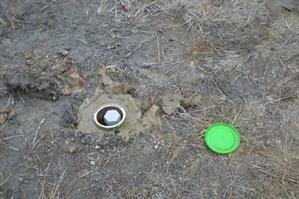 The core catcher performed flawlessly by making it simple to remove the cores from deep in the hole. On our second drilling we drilled a nephrite jade boulder at about the same rate without any problem. Since nephrite is a very tough rock I'm guessing this baby will core drill almost any stone with great success. This tool is now an integral part of our exploratory tool assortment. Thank You for a quality product at an affordable price. 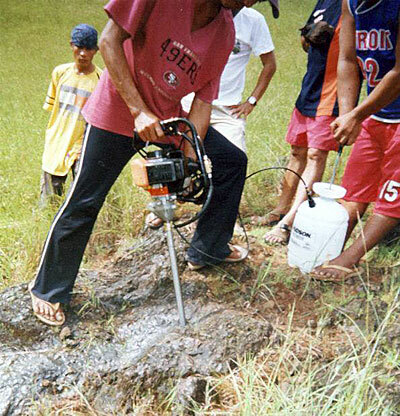 “This core drilling was conducted in a very remote area in the Philippines where we fly in via helicopter. 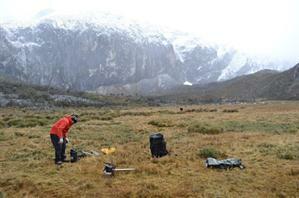 The little drill worked well and we were able to collect core samples of Magnetite. 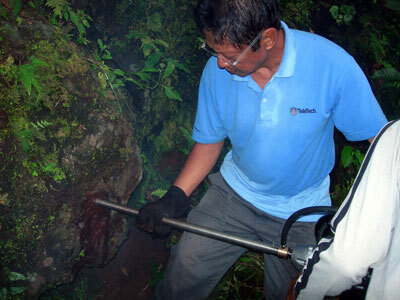 We collected a total of 300 meters of samples giving us a good composite analysis of the iron deposit." President, Cotton & Western Mining, Inc.
"The traditional tools of the field geologist are the compass, the hand lens and the geologists pick. Today all three traditional tools have been replaced: the compass by GPS, the hand lens by the portable hand analyzer and the geologists pick by the Shaw portable core drill." We drilled with the Shaw equipment yesterday and hit a sand artesian aquifer at about 35 feet. We drilled through this layer and got down to 47 feet. When we removed the drill rod the water coming from the boring looked like a geyser! It was pretty funny. The aquifer was contained, both top and bottom, in an unusual, light blue clay. Dr's. Beth Parker and John Cherry are leading a team of researchers at the G360 Centre for Applied Groundwater Research at the University of Guelph, Guelph, Ontario, Canada (www.g360.uoguelph.ca), who are using the Shaw Portable Core Drill (Shaw Drill) for installation of monitoring wells in bedrock. To date wells have been installed in dolostone near Guelph for study of groundwater hydrology with emphasis on groundwater-river interactions, and in sandstone near Simi Valley (Los Angeles area), California for monitoring groundwater conditions at seeps and springs on mountain slopes with emphasis on a search for organic contaminants. 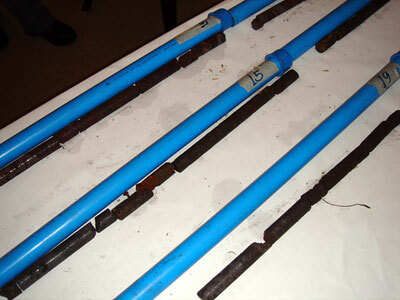 The borings for monitoring wells have a diameter of either 1.65 inches (41 mm) or 2.00 inches (51 mm). 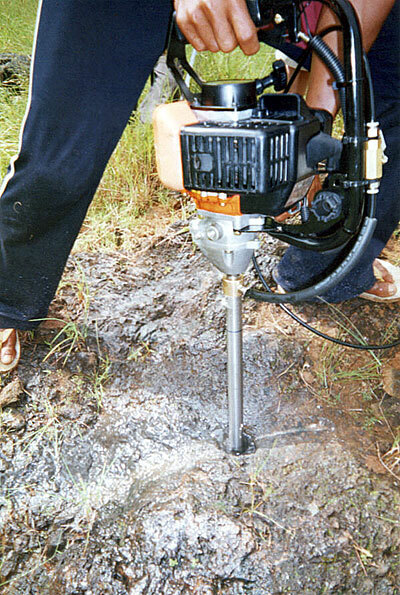 The design of the monitoring wells is unique to accommodate small diameter borings. In the two inch borings, the well casing has inside diameter of 0.90 inches, which allows use of self- contained pressure transducers (i.e., Schlumberger Micro-Diver Model DI601) for monitoring hydraulic head. The Shaw Drill has proven to be effective and reliable in these studies. It has made possible installation of monitoring wells at locations where larger drills present great difficulty of access. Use of the Shaw Drill has minimized disturbance to the terrain in ecologically sensitive areas. The borings drilled so far using the Shaw Drill have ranged from 5 to 32 feet below ground surface. Deeper drilling is likely feasible. The University of Guelph in collaboration with Shaw Tool is continuing research and development to extend the capability of this drilling method in groundwater investigations and also for creation of small-yield drinking water wells to supply remote areas in North America and developing countries. 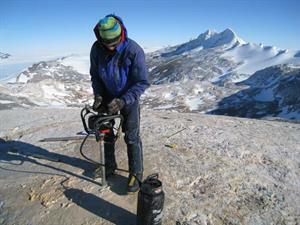 In 2012 the Shaw portable core drill was successfully used by a team led by Dr. Jeffrey McKenzie of McGill University, Montreal, Canada, for installation of shallow, small diameter monitoring wells in fine sediments and boulders in very high valleys located in the Andes Mountains of Peru. The drill worked great! We worked at two sites in Peru... one was at 4300 meters above sea level (14100 feet) and the other site was just under 4000 meters above sea level (13120 feet). 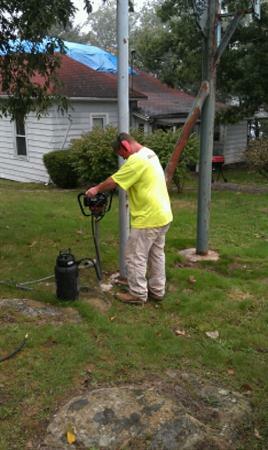 At both sites we drilled four holes and installed monitoring wells. The deepest hole was just over 20 feet deep and the shallowest was around 5 or 6 feet. 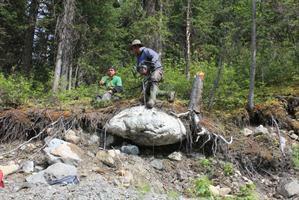 Most of the material was silts and clays, though we did go through some serious chunks of boulder. 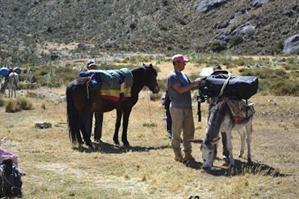 The elevation was tough, was especially at 4300 masl. It seriously tired us out, and there was a noticeable improvement in the rotational speed of the drill at the lower site. Regardless, it was really impressive. The drill was fantastic! It took us a couple of days to figure out all the ins and outs. We didn't initially realize that we needed to be lubing the pipe sections before connecting them, which made separating them really tough (especially at elevation at the end of the day!). Also a few times we had to drill through a course sand or gravel layer which wasn't easy. I think that the drill had a hard time clearing the hole of the coarser material. We did manage to lose one of the augers... we went to drill one hole, maybe down 5 sections, and using the unconsolidated auger. When the drill started really spinning there were crazy vibrations, and when we pulled up the drill one section and the auger bit were missing! We managed to fish out the auger bit, but never recovered the unconsolidated bit. Thankfully we had the backup. My guess is that we hadn't locked the section by accident, though it should have tightened. We may never know what happened. If I was to change one thing, it would be to bring along another person next time. With just me and a grad student it was a lot of physical labor. 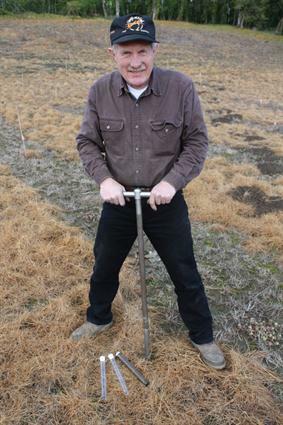 “I had a problem with very large basalt boulder in the vineyard rows that was causing a tractor safety problem. The location of the rock meant that we could not use a trackhoe or scoop to remove it without damaging the vines. The backpack drill allowed us to drill a series of holes around the ground emergent portion (in about an hour) and to fill those holes with expanding cement. We drilled and filled on Tuesday. When I returned to the site on Thursday, nothing had happed. When I returned on Saturday, my neighbor asked what I had done to the rock. By Saturday there was nothing but rubble. The expanding cement just needed a little more time than I thought. Now the field boss is happy as the tractor can go over the former rock location without fear for tipping into the vines. I now have my eyes on some other problem rocks in the vineyard." Owner, Hidden Rocks Estate Vineyard. The Shaw Backpack Core Drill worked great. I have used it on five different sites in Alaska now. When I first purchased the drill, I was going to leave it with the original sit as "collateral damage" as a cost of doing business in remote Alaska. I liked the drill so much, that I took the extra time to ship it as hazmat on a regional airline. As a quick summary, here has been my experience. Customer Service: It has been great! Your team has helped customize my order based on my needs for a couple of different sites now. Bits: The elephant tooth bit should be standard or recommended for each purchase. I bought it later as an add on and loved it. The diamond bit works great too. I cut through an extremely hard andesite rock like it was butter. On my first site, I scheduled six hours to drill ten feet into very hard rock. It took me a little over an hour! 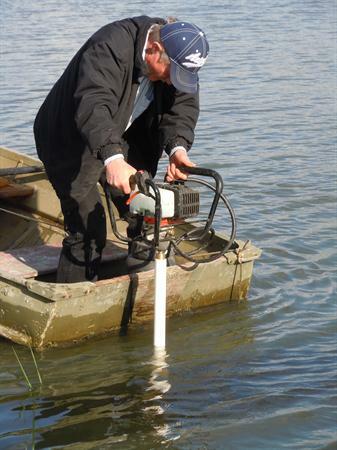 Water: Water is the biggest headache with using the drill remotely. It takes practice on regulating the water, but the tanks that come with the system are amazing. I couldn't break them if I wanted. Motor: The fuel consumption was a bit more than I expected, but still seems reasonable. Getting the oil mixture was a bit tricky, so I appreciated the extra spark plug. The motor is a lot more powerful than I expected, and vibrates less than any other two cycle engine I have ever used. 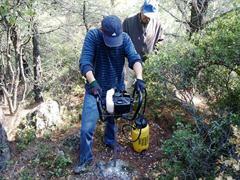 Other Applications: I've used the drill once to take a permafrost samples. It actually worked. The samples came out beautifully. 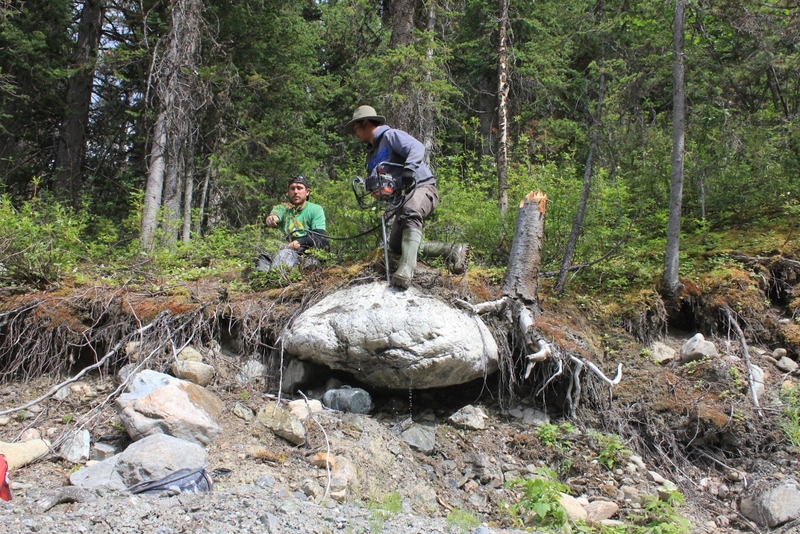 Drilling in permafrost goes a bit slower than soft rock, but doesn't require much water to keep the bit cool. Permafrost sample below. At the request of Colin Webb, a Usibelli Coal Mine Inc. mining engineer, on 27 August 2013 I traveled first by air to Fairbanks and then by rented car to Healy, Alaska, to demonstrate the use of the Shaw portable core drill for boring and sampling of sub-bituminous coal. 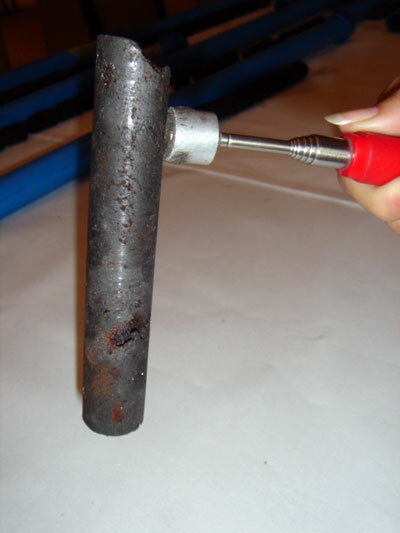 As we at Shaw Tool had only done a limited drilling test on a one cubic foot purchased sample of anthracite, it was not known with certainty that the Healey test would be successful. It was feared that the somewhat softer than anthracite Healy material might “slick” the diamond bit face and thereby defeat its abrasive cutting action. 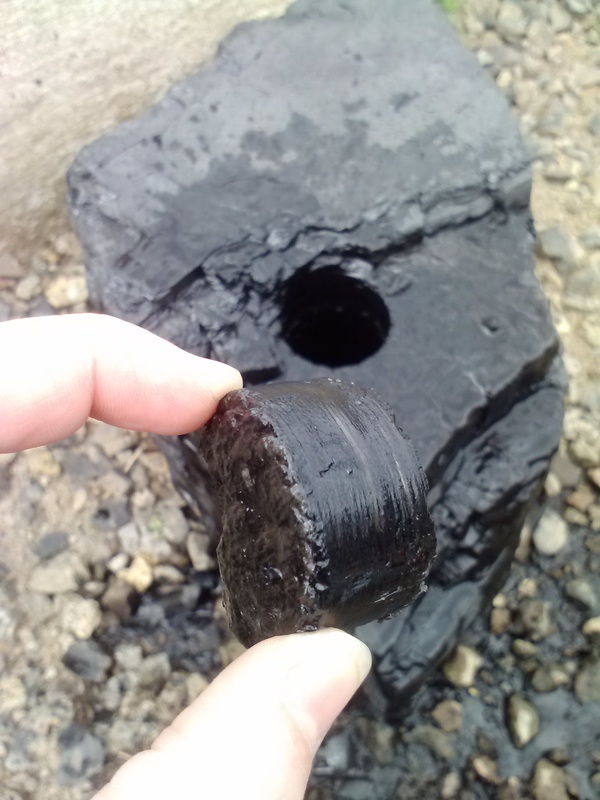 On the morning of the 28th Colin showed me an exposed coal seam upper surface for our test. 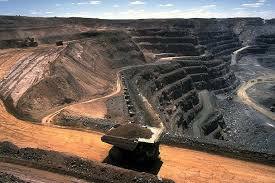 Having fueled a new engine drill, started it and filled the two backpack water bottles prior to arrival at the mine site, I was able to carry the rather heavy but complete drill kit up the hill from Webb’s pickup to the test location and begin drilling without any delay. The bit eased into the coal easily if a little slowly, producing a dilute clear brown cuttings stream. 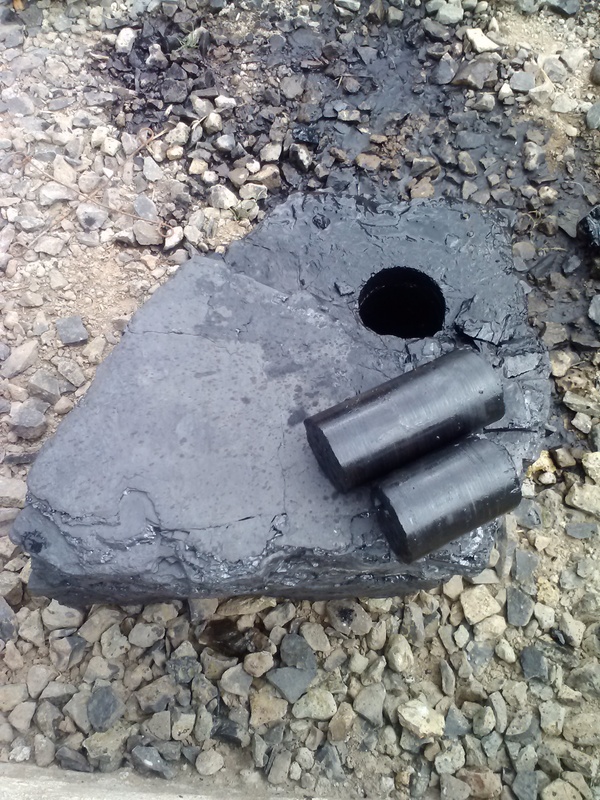 Smooth, easy drilling produced long, straight, smooth-sided, nearly seamless coal cores of about 36 mm. Colin, who drilled two feet of core with the use of a light aluminum extension had no difficulty at all in advancing the bit, capturing core and removing it with the kit knockout rod on his first attempt. 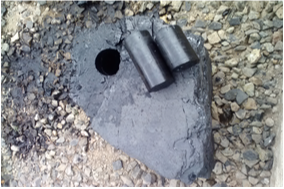 After the test we noted that here was no abrasion at all of the aluminum extension by the soft and naturally lubricative coal. I concluded that the reliable penetration of the core bit with no “slicking” tendency was due to the good water circulation and the serrated cutting surface of our elephant tooth™ diamond bit. "The company owner, Neil Shaw, couldn't be a nicer guy. I visited him in Yamhill to learn how to use the drill, and did so with success in remote jungle locations of the sub-Andean fold-and-thrust belt in Peru. It works. No problems." It was also decided in our concluding remarks that in normal use at the Usibelli mine site that the Shaw drill would be supported with a 25 gallon water tank with 12 Volt on-demand pump, a long (25 feet? ), small diameter water hose and a car battery held in the back of a company pickup. Colin intended to use the drill for collecting high quality channel core samples for later BTU analyses. He collected our drill test core samples in a plastic bag to be shown later to co-workers and others. No pictures were taken of the test or the site in conformity with Usibelli corporate policy. 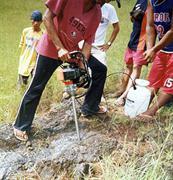 Treasure and cave hunters are naturally reluctant to share their field findings but quite a number of Shaw drills have come into use by them throughout the world, notably in the Philippines, in the American Southwest and on Islands in both the North Atlantic and North Pacific Oceans. 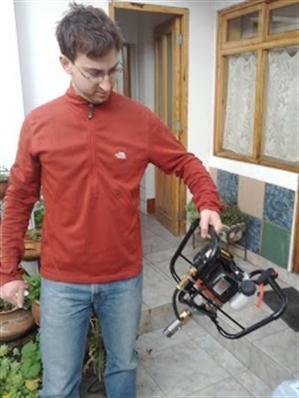 In recent years the Shaw portable core drill, particularly in the 41 mm size, has been widely used for marble, travertine and granite quarry stone exploration at remote sites in Turkey.